Nerve is a frightening movie, frightening in that it is not too far removed from reality, or should I say, virtual reality. While a lot of things in Nerve are extremely coincidental (and I mean a lot), the story moves well enough to give us a funhouse mirror reflection into the power and perverse nature of online activity and of how people can both manipulate and be manipulated by said forces. Venus, better known as Vee (Emma Roberts) is a high school senior, who like most high schoolers today lives online. She's thoroughly connected, but still a bit on the outside. A talented photographer, she's been accepted to Cal Arts but feels pressured by finances to decline it, finding it safer and cheaper to stay on Staten Island. Though her heart is in going, part of her fears the change and fears leaving her mother Nancy (Juliette Lewis). Vee has a few friends, like her platonic male friend Tommy (Miles Heizer) and her more outgoing, daredevil-like Sydney (Emily Meade). She's pretty outrageous, like when she mooned a football game as a cheerleader. Like most teenagers, she chronicles her activities, but unlike most who just do it because they think people will enjoy such antics, Sydney has a financial/popularity reason for this. She is part of a subculture online game called Nerve, where people are either Watchers or Players. The Watchers pay to watch and give Players various challenges (or dares) to perform. Players who successfully complete their task in the allotted time win money. A mixture of challenges and viewers get the players to the Finals. Sydney pushes Vee about being a real-life Watcher, always observing but never participating in life (such as Vee's fixation on the high school quarterback). Against her better judgment and over the objections of Tommy, she signs up to be a Player on Nerve. Her first Dare is rather innocuous: kiss a stranger for five seconds. She finds said stranger, who happens to be reading her favorite book, By the Lighthouse. This stranger, named Ian (Dave Franco), then has a surprise of his own: he starts singing Roy Orbison's You Got It to the entire restaurant. It's no surprise that this impromptu number is recorded on cell phone. Ian too is a Player, and they've been brought together deliberately by Watchers. To their surprise, they are paired as a team to continue doing more dares. Vee's popularity begins to grow, and she soon starts getting more followers. Sydney, an experienced Player, finds the news most irritating. To outdo Vee and Ian, she agrees to do a dangerous Dare: walk across an alley on a suspended ladder. She fails in her attempt and declares that she 'bails', thus dropping out of the game. Ian and Vee soon start getting manipulated into doing more and more dangerous Dares (with Ian being manipulative himself, Vee the ultimate dupe). Vee follows through on Sydney's failed Dare, and unknown to her the increases in their bank account raises Nancy's concerns. Tommy for his part discovers Ian's past: in Seattle, he and two other Players made it to the Finals, but one of those Players was killed when the Dare (to hang from a construction crane) plunged to his death. As the film goes on, not only are the Dares growing more dangerous, but Vee herself inadvertently puts herself in danger when she attempts to tell a policeman about Nerve. She has violated one of the three rules in Nerve: Snitches Get Stiches. She now must win the Final, or essentially be killed. Tommy, who is a hacker and well-versed in 'the dark web', attempts frantically to save her, as does Ian, who says that he too is a prisoner of Nerve. Only Ty (Colson Baker, better known as rapper Machine Gun Kelly), a more vicious Player, stands in their way. It's a final showdown where Watchers get more vicious, calling for literal death and Prisoners (Vee, Ty, and Ian) all fight to stay alive before the morning's light. In a certain way, Nerve appears to be a teen-centered version of The Game, a movie starring Michael Douglas and Sean Penn. In that one, Penn's character gets his brother (Douglas) to participate in an elaborate game that takes place in the real world which creates havoc in his life. I didn't like The Game, finding it all too improbable to be remotely believable. 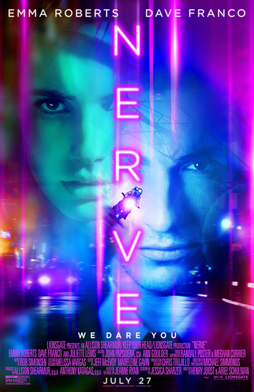 Nerve, on the other hand, is more plausible (if not entirely believable) primarily because it does reflect a better sense of what today's teens are like. They chronicle their lives for others to see, they are passive viewers of 'reality television', and on occasion have a shocking amorality to situations. Not once in Nerve did the Watchers who were friends to Vee or Sydney ever attempt to stop them from doing the more dangerous Dares (such as walking several feet above ground on a ladder or driving a motorcycle blindfolded to sixty miles per hour). Instead, they watched, perhaps entertained, but divorced from a sense that what they were watching was 'real'. Using that interpretation, Nerve becomes a sharp, pointed commentary on Millennial narcissism and lack of morals/ethics. It is the 'entertainment' factor to Watchers that motivates them, not the dangers or the morality of the situations they put Players in. I found some of it genuinely frightening: not necessarily the stunts though they were intense (such as when Ty lays on subway tracks while a train rushes over him). I was frightened by the perverse enjoyment people took in seeing dangerous, criminal, and even murderous acts being committed and they not caring about any of it. 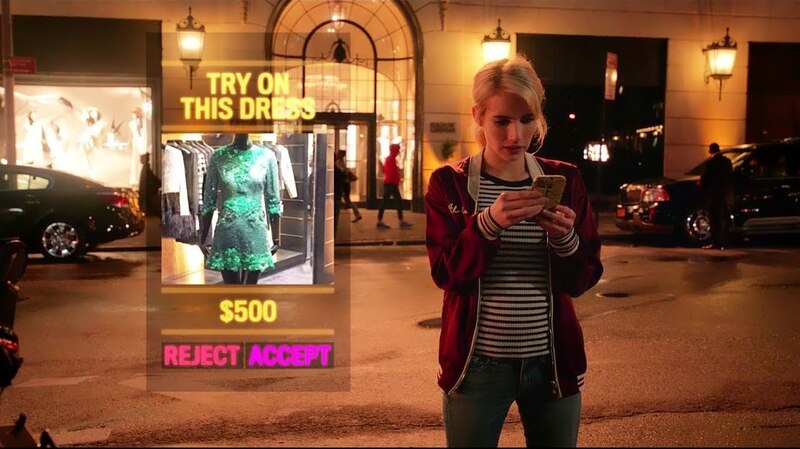 In a lot of ways, Nerve hits the nail on the head as to how teens are: how they equate worth with number of 'followers' (in real life, on Twitter, Instagram or maybe Facebook versus the Nerve game), how they are passive, almost gleeful in recording all sorts of things for others to watch, and how the bleeding of reality and fantasy become one, indistinguishable one from the other. I may be giving Nerve more credit than it deserves, though I cannot say whether Jeanne Ryan's novel (which Jessica Sharzer adapted) was meant as commentary. I just interpret it that way. The performances were on the whole good. Emma Roberts made for a fine Vee (short for Venus, I might add), that hesitancy and confusion mixed with the slow thrill of coming alive. Franco continues to build on his successes as Ian, the dubious Player who is playing a game of his own. Meade and Heizer did much better than their roles (the somewhat skanky but secretly insecure friend and the 'friend-zoned' male pal). Lewis had essentially little to do apart from look worried, but she did what she could with such a small part. If Nerve has a flaw, it's within the story itself. As is the case with a lot of films, a long number of things have to happen to make the story flow, even if it depends on a great number of coincidences and contrivances. No doubt Ian was directed to bring To the Lighthouse with him when Vee was set up with her first dare, but what if she had found another stranger to kiss? What if she had bailed at that point (neither gaining or losing any money)? What if Vee didn't have Tommy or Sydney (who does reconcile with her bestie by the time the film ends) helping her out? What if Tommy wasn't a hacker? What if Sydney had completed her dare or Vee hadn't? What if Vee and Sydney hadn't fought? What if...what if...what if... Nerve, to be believable, or even plausible, relies on too many 'what ifs', to get going. I'm not begrudging that fact, merely pointing out that things have to work out just right to make things actually work. Maybe that's why The Game came to mind; like in Nerve, The Game relied on too many things going exactly right in order to work. One slight change and everything would fall apart. I didn't dislike Nerve. I will fault it for being a bit clichéd with characters and with having a story that stretches believability. However, I did find as a commentary on how 'reality' can be false, even dangerous, and on how people are too busy documenting their lives for others to live lives for themselves, Nerve has enough to recommend it.